U.S., Montana, Idado and Wyoming flags as well as four pennants similar to those originally flown now fly atop the building. 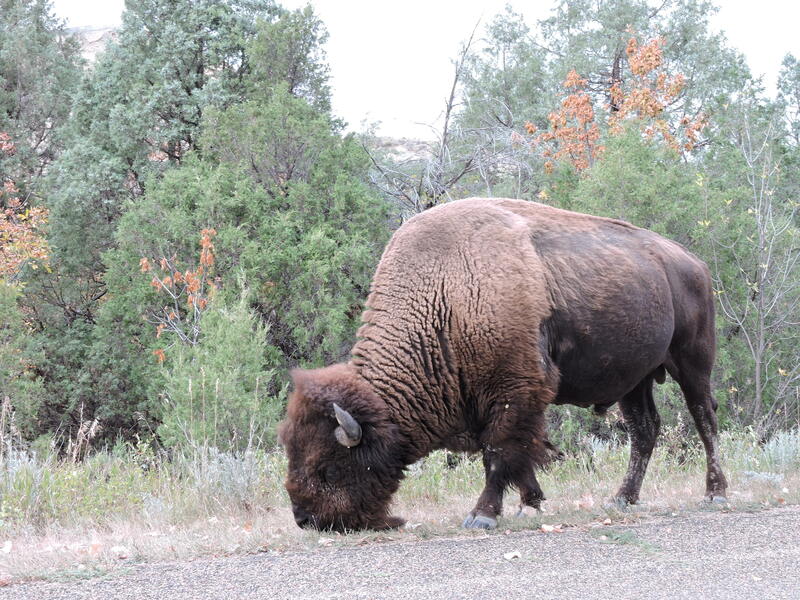 Much has been written about Yellowstone National Park, the U.S.’s first National Park  and the world’s largest collection of geysers, hot springs and other hydro-thermal features. 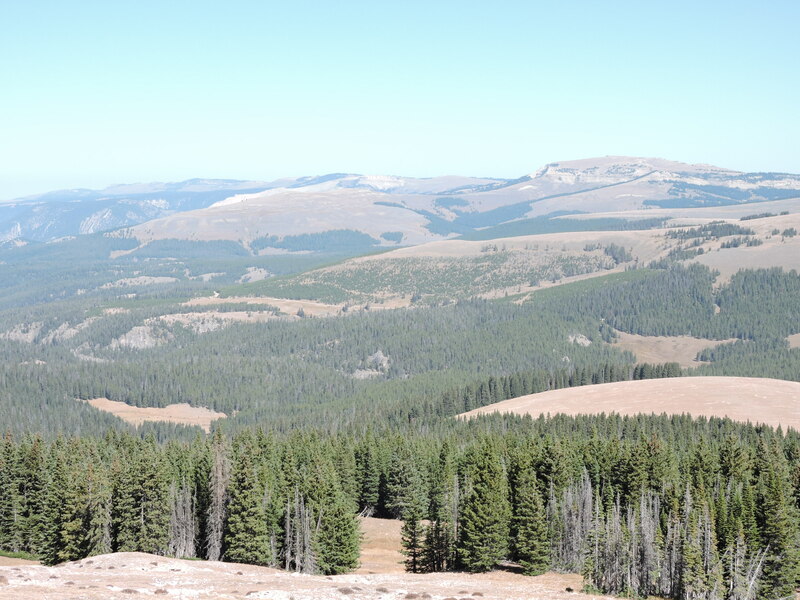 It encompasses a 30 mile by 45 mile caldera over a gigantic super-volcano. For many, log cabins symbolize America’s frontier days. 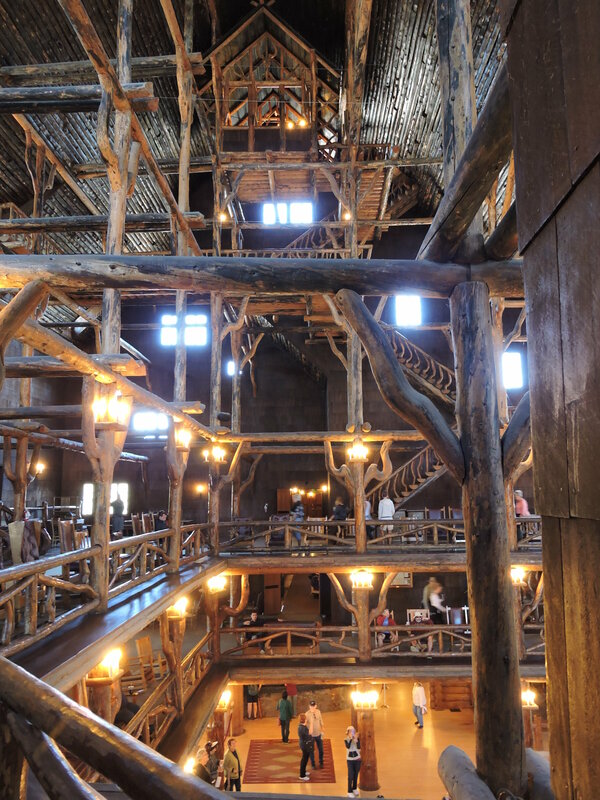 Built in 1904, the Old Faithful Inn is one of the largest log structures in the world. Architect Robert C Reamer made the building asymmetrical to better reflect nature. 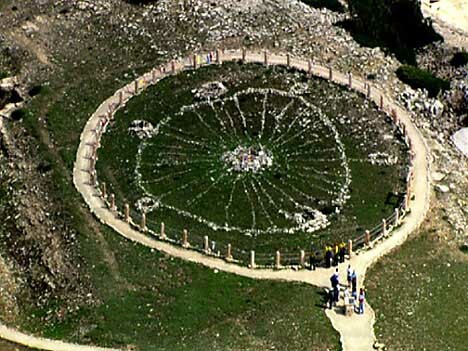 The huge center fireplace, foundation and other stone features are rhyolite, stone created when the volcano erupted and quarried in the nearby Black Sand Basin. Reamer put a Crow’s Nest just below the seventy-six and a half foot high ceiling. An orchestra played there after dinner in the early years while guests danced below. A 1959 earthquake measuring 7.5 on the Richter Scale twisted some of the support beams making it unsafe for the public now. Other features, such as the iron and brass clock on the fireplace, many chairs and chandeliers are original, now 114 years old. The original center portion, the Old House, had 140 rooms with a bath on the hallway. Expansions in 1914 and 1927 resulted in more than 300 rooms. 87 Old House rooms are still available. Most still do not have a private bath but are nonetheless in high demand. Looking down from the third balcony. An empty table for those who still write cards and letters. A pendulum clock in on one side of chimney with fireplaces on four sides. Natural shaped-logs were used whenever possible. 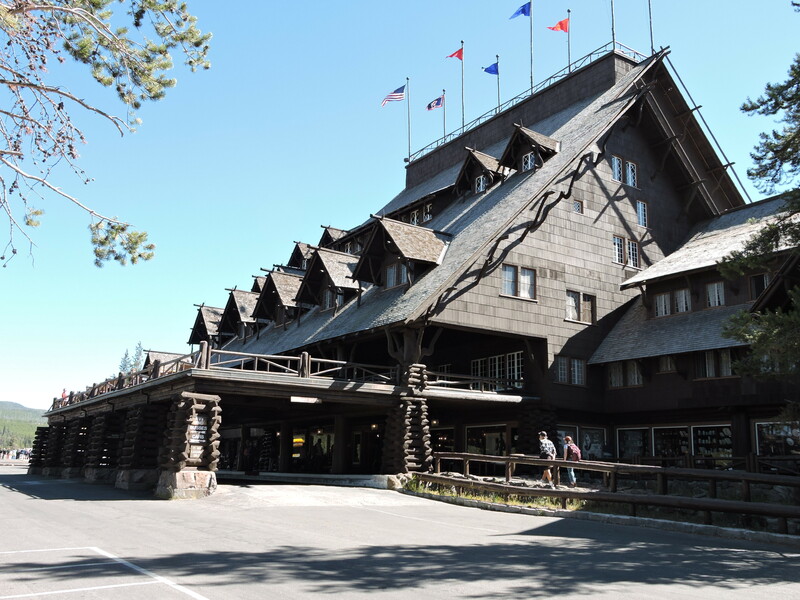 A portico was extended over the entrance driveway from which guests still can view the eruption of Old Faithful from a chair with a drink in hand. Old Faithful is not the highest or largest geyser in the park, but it is the most predictable. It once spouted on average every 66 minutes but the time gradually increased over the years. Now it spouts between 65 and 91 minutes with a margin of error of 10 minutes both ways depending on the duration of the previous eruption. P.S., Despite sensationalist articles to the contrary, scientists think the super-volcano is unlikely to erupt again in our lifetime. 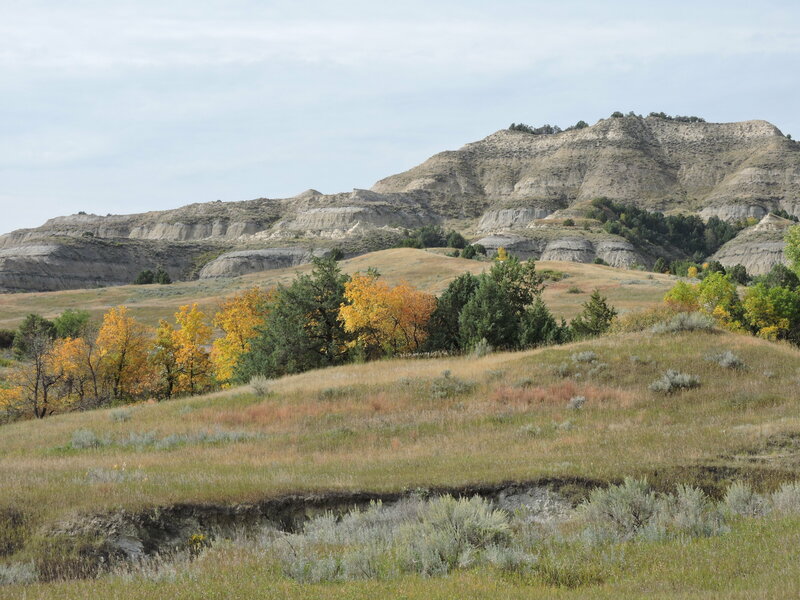 Here are some more scenes from our fall 2018 drive around the U.S. Click on photos to enlarge. Hit the back button to go back to the post. 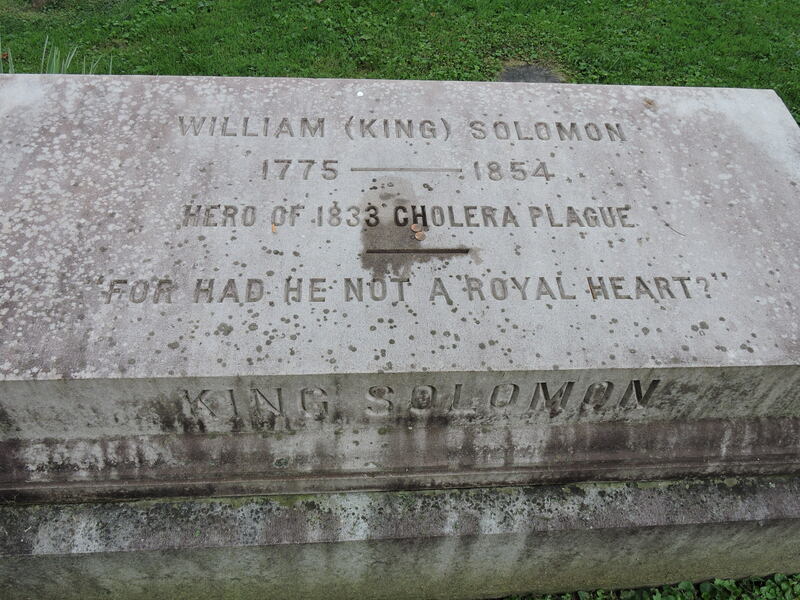 “King” Solomon was the Lexington town drunk who became a hero when he helped bury the dead during a 1833 cholera plague. 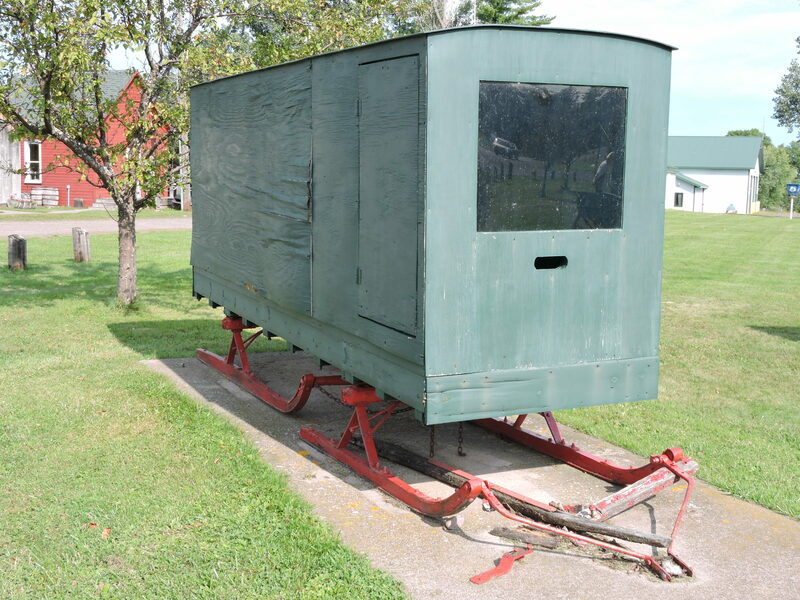 The first consolidated school district in Wisconsin  was also the first to provide free transportation to school. 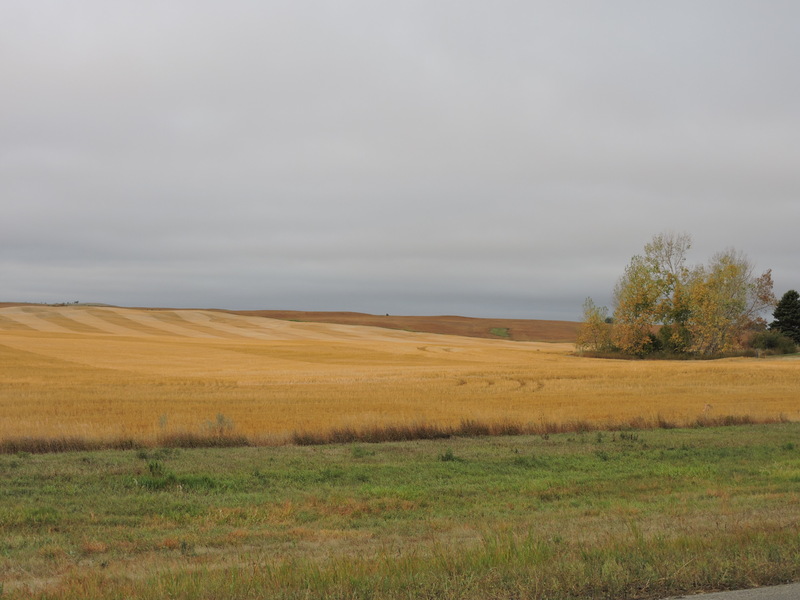 We passed through beautiful wheat fields on the Spirit Lake [First American] Reservation near Minot, North Dakota. 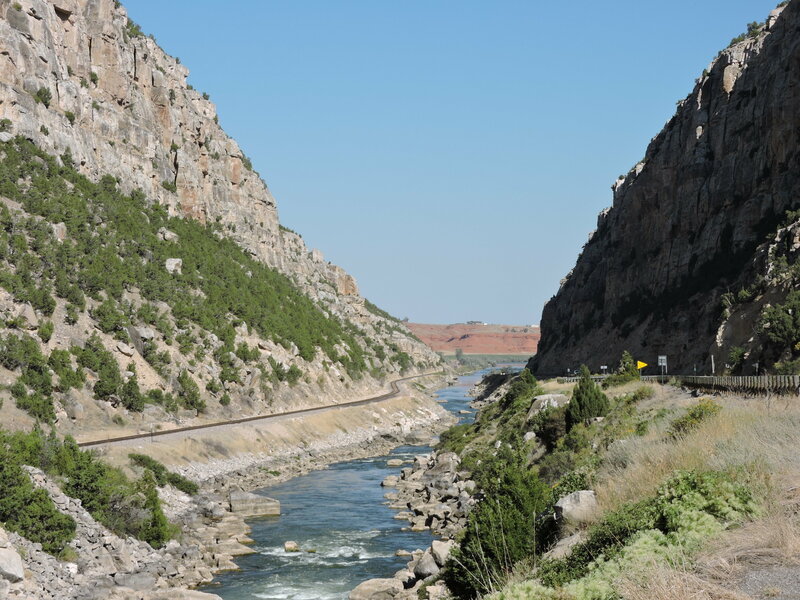 as was the Wind River Canyon to the south. 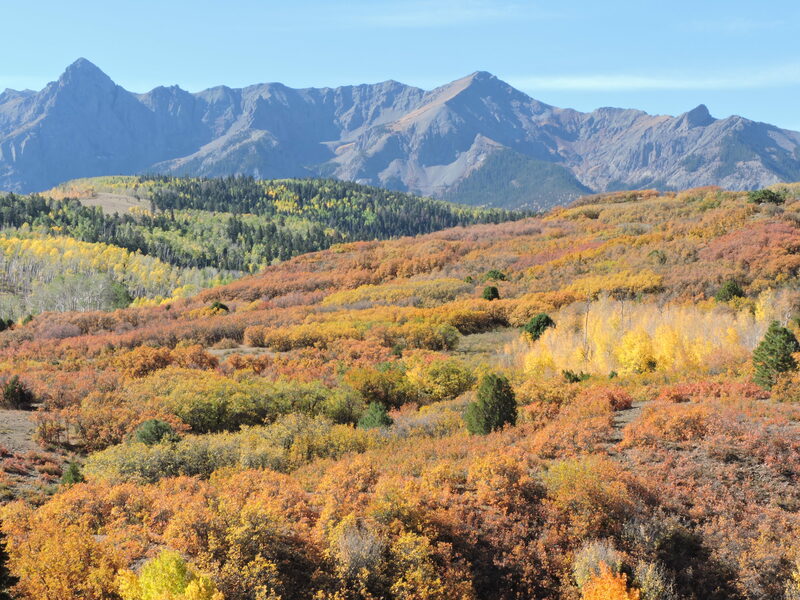 We never really focused before on how beautiful the fall colors are in the Rockies. Who knew there was a national monument dedicated to First American graffiti. 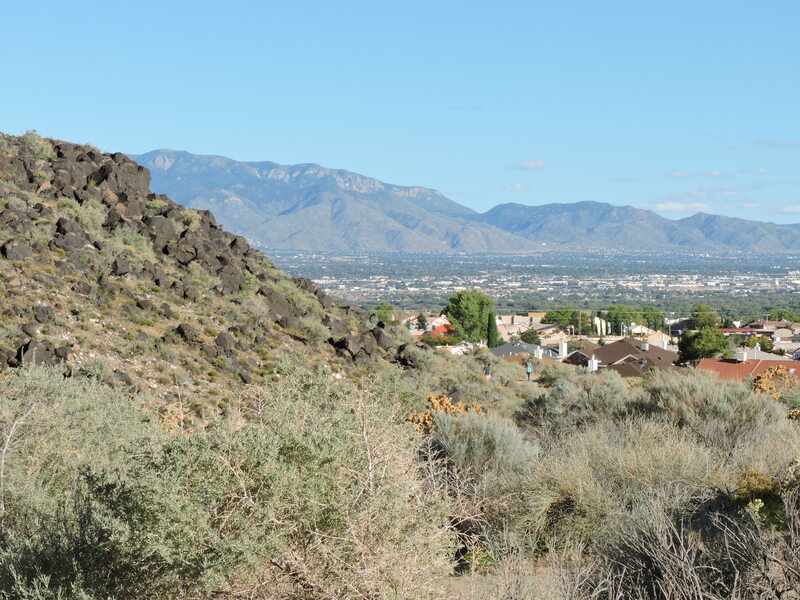 The Petroglyph National Monument is in the suburbs of Albuquerque, has pleasant easy trails to walk, and a great variety of petroglyphs to see. 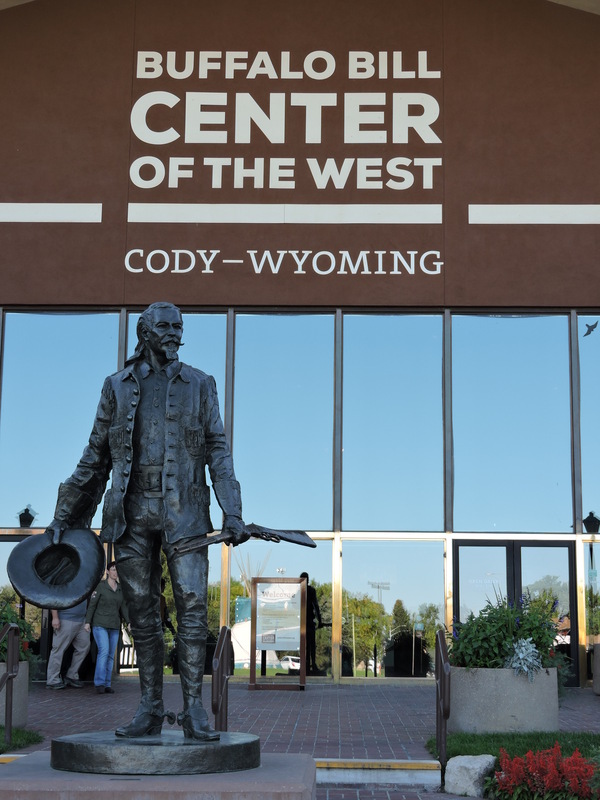 We visited the Buffalo Bill Museum, part of the Buffalo Bill Center of The West, in Cody, Wyoming. William F. Cody was a showman and performer for much of his life. 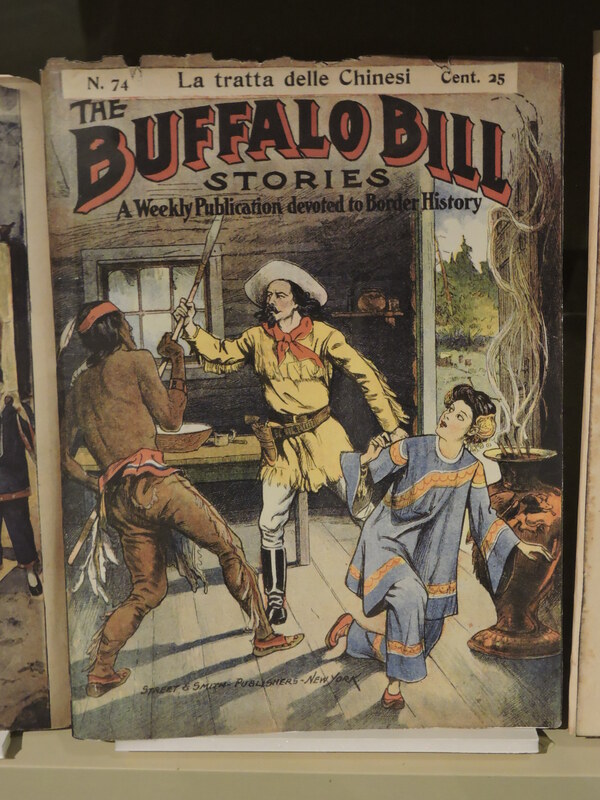 “Dime novels” and “pulp fiction” told tales about his life, often exaggerated and often fiction. Sometimes Cody himself blurred the lines. But as we toured the museum, it was clear no exaggeration was needed. He truly had an amazing life that novelists would be hard pressed to imagine. 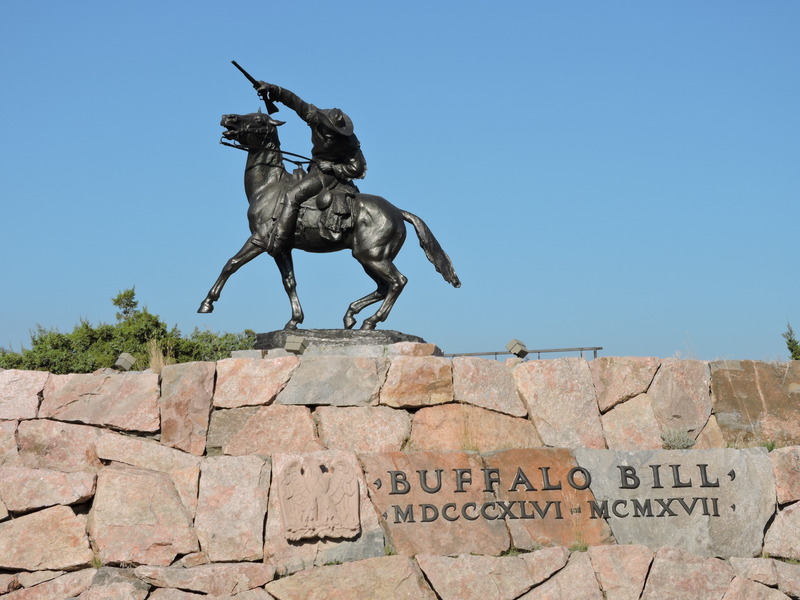 “Buffalo Bill” Cody was born in 1846 in Iowa. He died in 1917, just short of his 71st birthday. He grew up on the frontier with Kickapoo First American friends alongside cowboys, hunters and teamsters who shared their skills. While living in “Bleeding Kansas,” his abolitionist father was stabbed by pro-slavery forces. When Cody was 11, his father died of some disease, and like many boys on the frontier, he went to work. He tended cattle for the nation’s largest overland freight company. 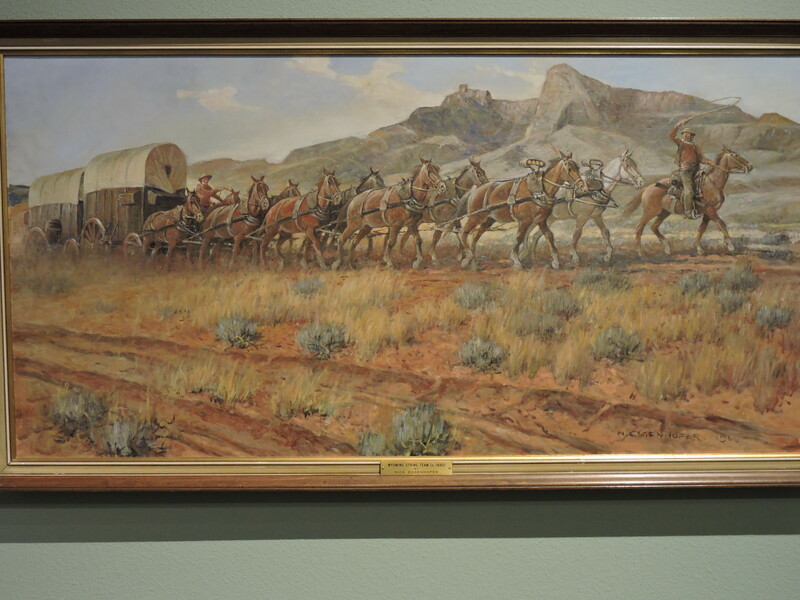 He was a “bullwhacker,” driving cattle, and within three years was wagon boss, managing employees and gaining first-hand experience on the plains at age 14. 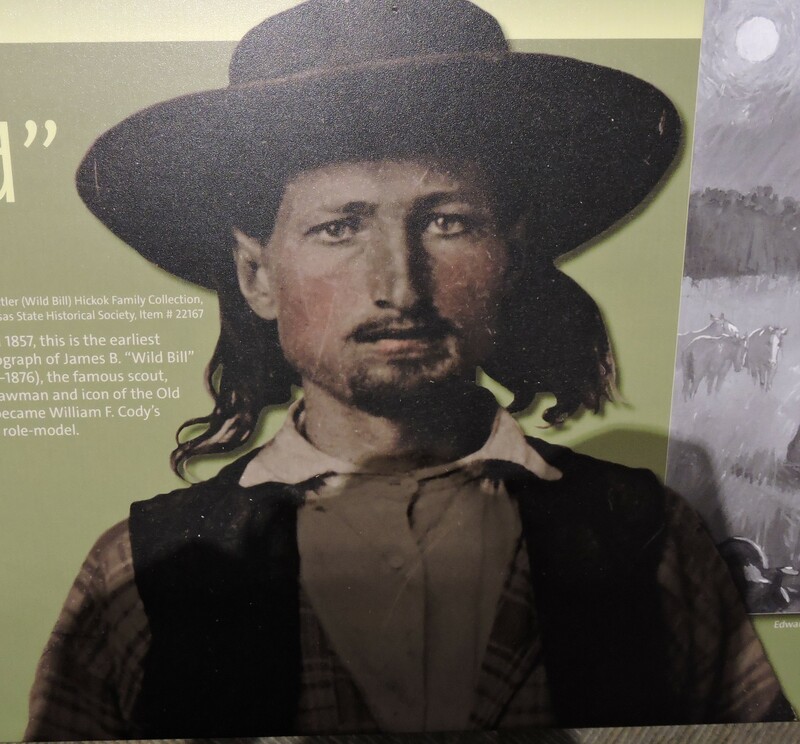 James Butler Hickok earned the name “Wild Bill” for his exploits as a scout and spy during the Civil War and was 10 years older than Cody. They met when Hickok was a teamster and came to young Cody’s rescue when he was attacked by another teamster. 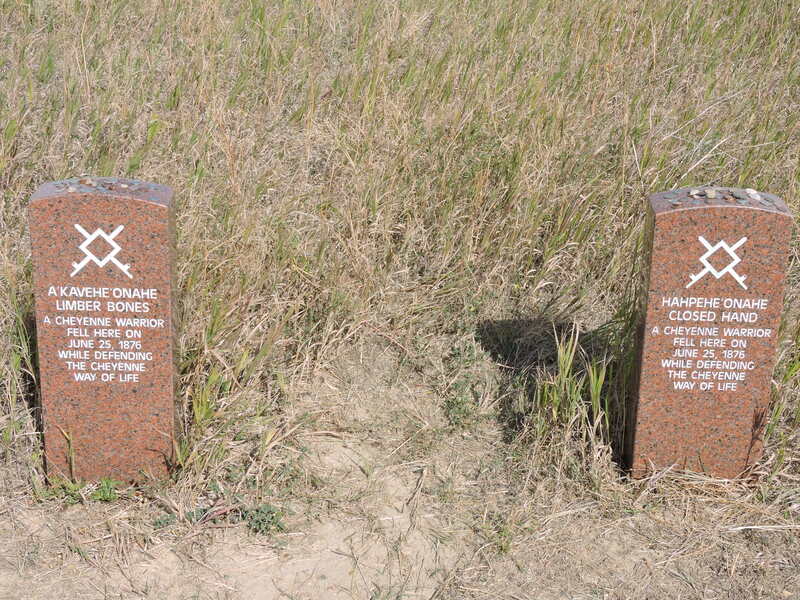 From that point on, Hickok was Cody’s hero, mentor and friend. The freighting company began the pony express in 1860 taking mail by fast horse relays 2,000 miles from St. Joseph, Missouri to Sacramento, California. It was a tough and dangerous job. Evidence is mixed as to whether Cody was a pony express rider. He rode as a messenger for the company and may have considered the jobs to be the same. 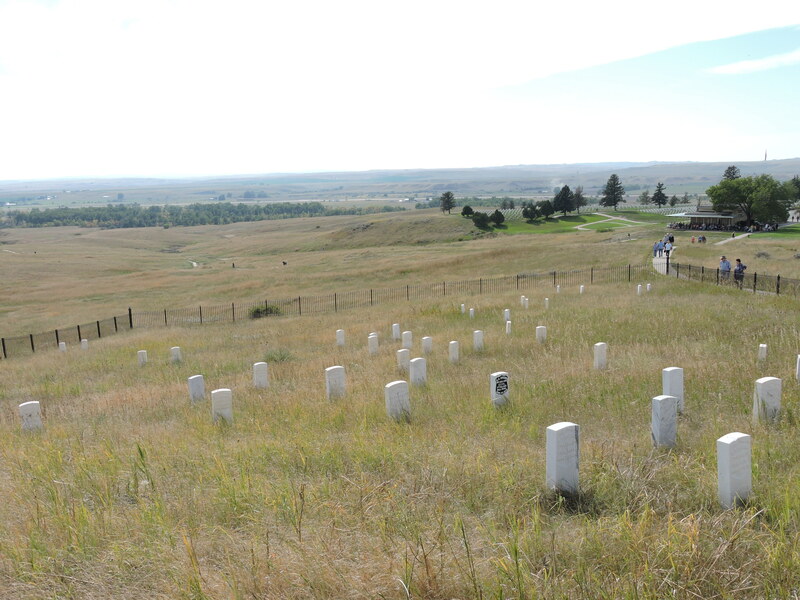 His mother died in 1863, and now 17, he joined the 7th Kansas Volunteer Cavalry and fought in the Civil War. He married in 1866 and operated a hotel in Leavenworth, Kansas but soon found life as a hotel proprietor “too tame.” He was absent for the birth of each of his three children. At age 21 in 1867 he became a professional hunter supplying meat to railroad construction employees and Army forts. 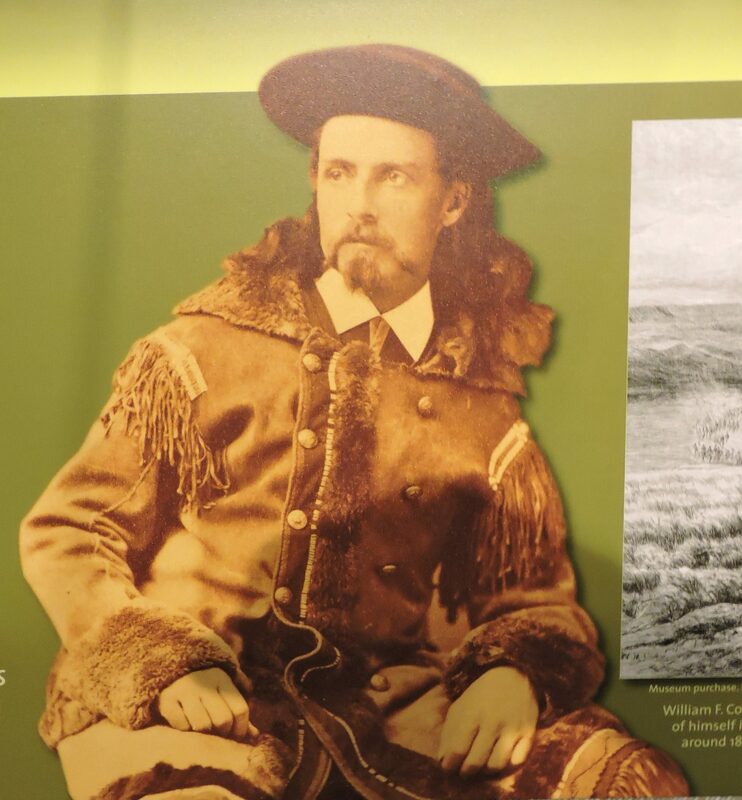 His skill as a rifleman earned him the sobriquet “Buffalo Bill,” but he never hunted the animals for their hides and disapproved of the practice. Cody, the scout, ca. 1869. 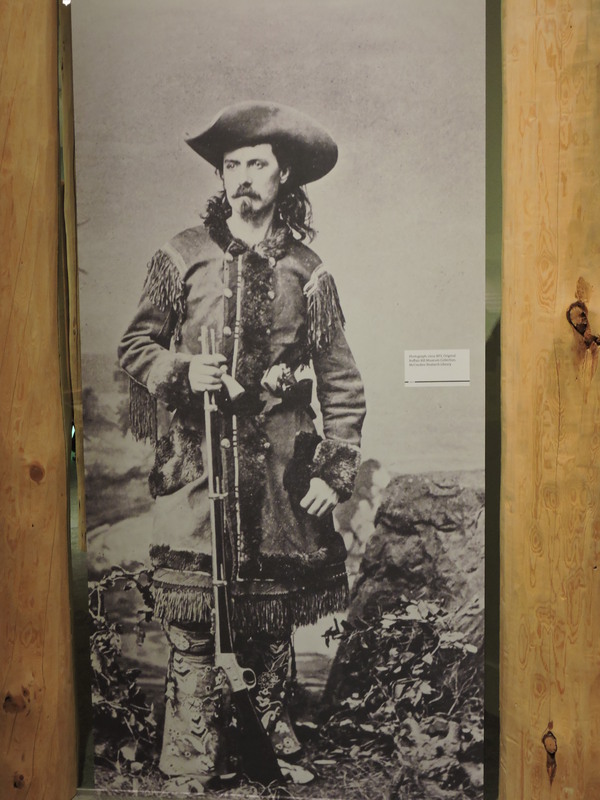 Long hair protected the frontiersman from the weather. Impressed with Cody’s ability to get messages through hostile territory, General Philip Sheridan named him Chief of Scouts for the Fifth Cavalry in 1868 [he was only 22], a post he held for four years. He became famed for his knowledge of the landscape, courage and tracking skills. He was even hired by a New York professor looking for fossils. Perhaps it was as a guide on hunting expeditions with Generals Sheridan and Custer and visiting dignitaries such as Grand Duke Alexis of Russia that he came to the attention of the press. A New York newspaper published the first story about him in 1869. Over the next 40 years around 700 short stories, novels and plays portrayed his life. During the winter, he even began to play the part of himself on stage and wrote an autobiography in 1879. 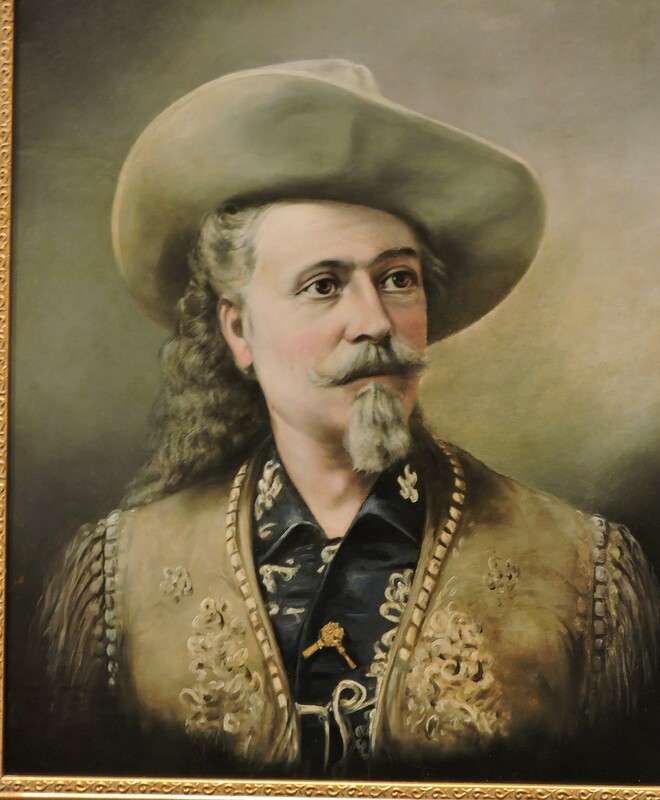 A newspaper reviewer said “Nobody could play the part of Buffalo Bill better than Buffalo Bill himself.” By the 1880s, he was a celebrity in North America and Europe. 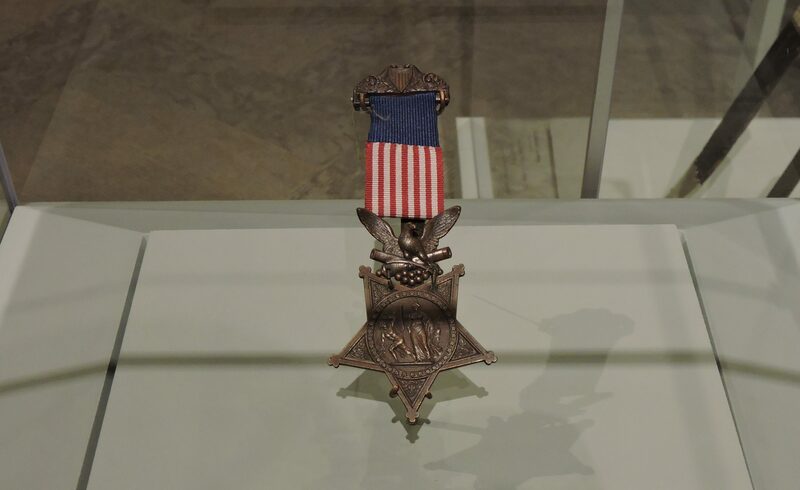 In 1872, he was awarded the Congressional Metal of Honor [given more frequently in that era] for his bravery when Sioux ambushed the Third Cavalry he was guiding. His was one of only four ever awarded to scouts during the Indian Wars. After the Buffalo Bill Combination theatrical company finished its winter season in 1876, he returned to the Fifth Cavalry. 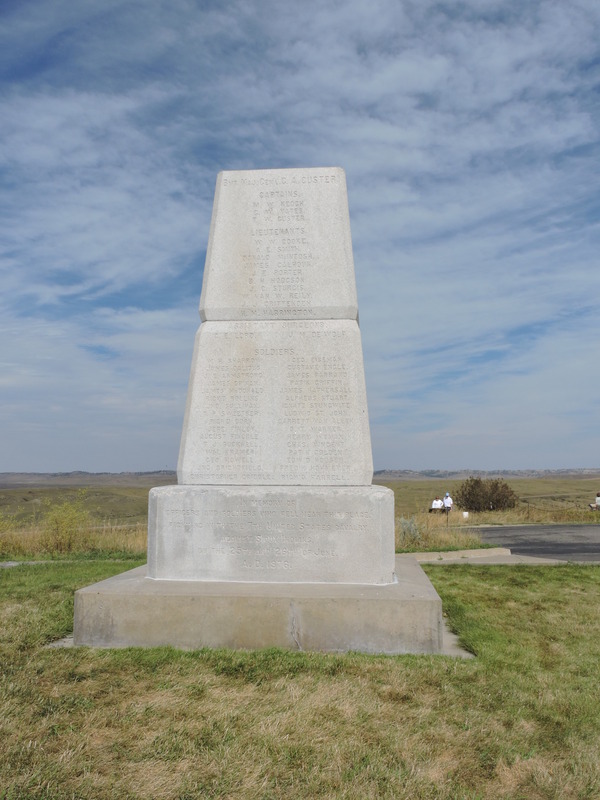 Fighting in a skirmish not long after the Battle of the Little Bighorn, Cody killed and scalped Yellow Hair, a Cheyenne warrior, and proclaimed “the first scalp for Custer.” It soon became the subject of another play. 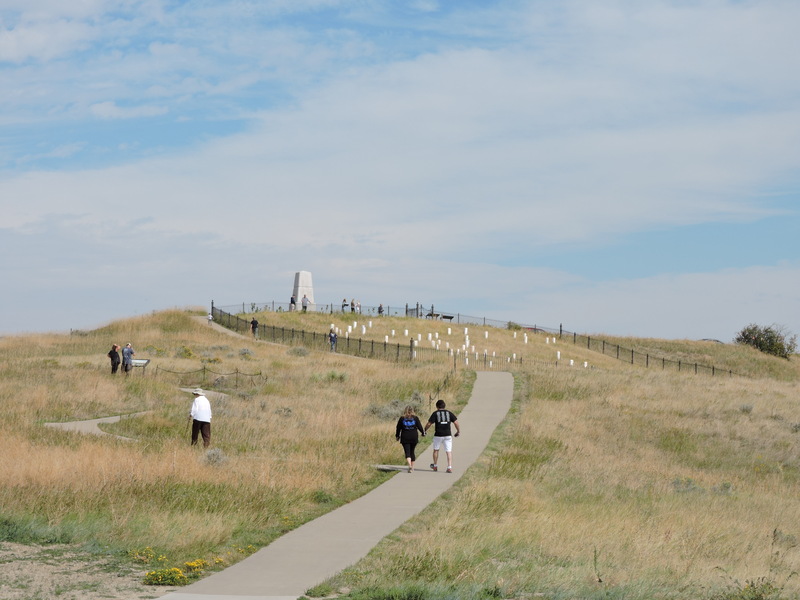 Feeling that plays did not reflect the scope of life on the plains, Cody created “Buffalo Bill’s Wild West” in 1883. It was a circus without clowns or acrobats. It had soldiers and Indians, sharpshooters and horsemanship. 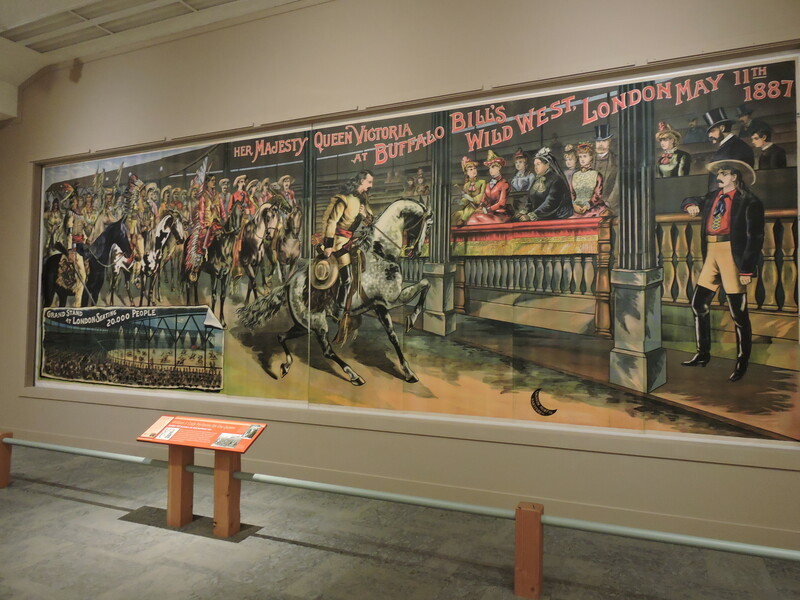 In 1887, he took Buffalo Bill’s Wild West to England and even had a command performance for Queen Victoria, cementing his place as an international star. Raised in a household with strong women and married to one, Cody became an advocate for equal rights for women. The show continued a success, and he invested his profits in many things including ranch land. Some investments were more successful than others. 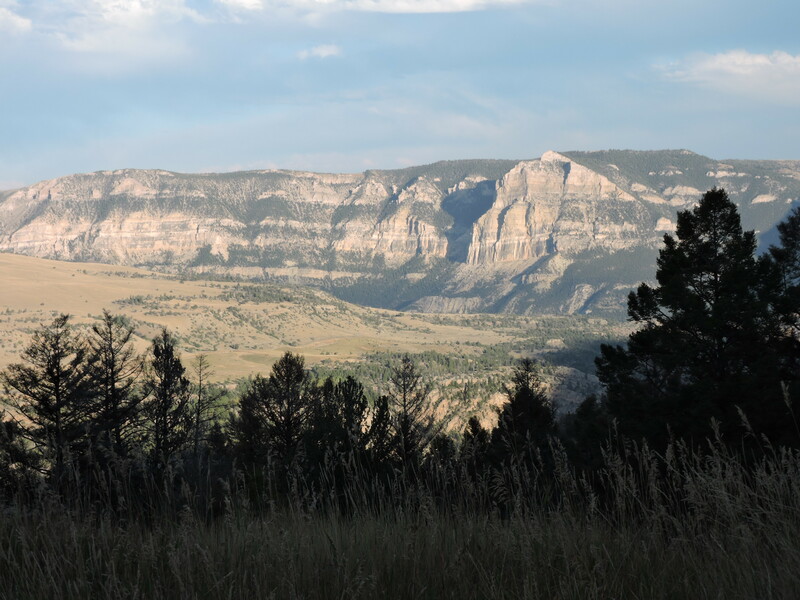 Eventually, the show went into bankruptcy in 1913, and he “retired” to his 2000-acre Wyoming ranch.